Frederick Vandenbosch has been at it again. This time, inspired by watching his kids use tablet devices, he’s built a gesture control device for his TV, which manages to be both functional and very elegant. At the core of this device is a Model A Raspberry Pi, and a Pimoroni Skywriter HAT. The Skywriter is a near-field electrical sensor that can detect 3d movements and gestures as well as swipes and taps – it’s one of my favourite HATs on the market at the moment (I have one which I’ve mostly been playing with in music projects). Here’s a naked Skywriter, doing its thing. Do the clickety thing with the audio button. Watch Jonathan Williamson’s Vine taken on 9 December 2014. It has 2 likes. The entertainment network where videos and personalities get really big, really fast. Download Vine to watch videos, remixes and trends before they blow up. This gesture controller talks to the TV using LIRC (Linux Infra-red Control); Frederick’s built an IR led to transmit, and an IR receiver, into the box; that’s what those two little holes in the front are for. Here’s a video guiding you through the build. Ever wanted to control your TV using gestures instead of a remote control? In this project, I use the Raspberry Pi and Skywriter HAT to convert gestures to infrared signals capable of controlling the TV. Have feedback on this project? Ideas for another? Let me know in the comments! Being Frederick (we’ve featured one of his meticulous projects here before), he’s documented the whole build minutely, so you’ll find it a doddle to make your own. Head over to his website for full instructions and code; and let us know if you build one of these for yourself! I guess this would also be useful for people with reduced mobility, who find the buttons on normal TV-remotes too fiddly? I DO like the sofa-arm idea. At least you would never lose the remote if it was embedded inside a sofa arm. Great project. You can put one in every arm and simply have a gesture that flips control from one bit to the other? Frederick, you’re just everywhere ! Genius. Another great project, you just forgot to add the “Giant Red Button” ;o) that’s all that’s missing for the perfect setup. Has it got the required (but exceedingly annoying) blue LED? Really nifty and impressive! He makes it sound so easy and natural. More interested in the musical applications of the Skywriter HAT, though. Had seen several references to that HAT, but it’s the first time it makes sense to me… and gives me musical ideas. Liz, do you have example code that you use for your musical experiments? Will be doing a @ClubFramboise workshop on sound, including Sam Aaron’s amazing Sonic Pi. 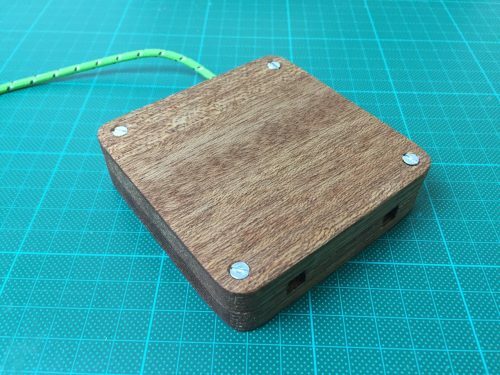 Have yet to find ways to connect GPIO or HAT sensors to that, but people are clamouring for just such a thing. If there’s a PiMusic group somewhere, count me in! Oh! With Puredata! That makes sense. Just ordered one. Hope it’ll get to Ottawa in time for a couple of tests before the workshop. Will also try the HAT with Pyo and, eventually, Sonic Pi. Thanks (as always) for the inspiration. Will have to look closer at this. Could be pretty useful for an interactive kiosk application – swipe to select pages, then a tap on box to start/stop audio/video/slideshow etc..
Yep. I was thinking the same. Set up a monitor behind glass to display information which can be browsed via a Skywriter, which is also inside.